Wine tasting is a pretty popular activity on the US Pacific Coast, with Napa Valley's visitor numbers second only to Disney Land amongst Californian attractions. However, there's lots of great wineries without the tourist hoardes and with a lot more character, Livermore Valley near San Francisco being just one. We'd decided to tour the wineries by bike since tasting copious wine and driving has got to be a bad idea, whereas at least cycling poses less of a threat to innocent bystanders. And cycling through the vineyards is infinitely more fun than sitting in a hot car! Livermore is one of the few wine areas that is accessible by public transport with a bike from San Francisco. Having hired bikes in San Francisco (from Bike & Roll, open 8am-9pm, $27/day for a utility bike) we took the BART out to its terminus at Dublin/Pleasanton and began the 9 mile cycle to Livermore. The route isn't all that pretty, just a cycle lane off the side of the road, but it passes quickly once you join Stanley Blvd. 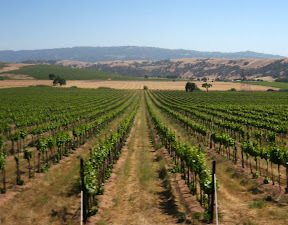 Once in Livermore itself, the vineyards lay out along South Livermore Ave and Tesla Road, one every few hundred metres. The winery descriptions at eveandersson.com were useful for planning the trip and I'd marked a few of particular interest on the map before we set off. We managed to fit 6 tastings into a relaxed afternoon, my favourites being the smaller more unique vineyards at White Crane and Murietta's Well. Most had a token tasting fee of ~$5 and offered a menu of 5 different wines. Although the standard menus ("flights" in wine jargon) were mixed, expressing a preference for reds-only often led to the whites being replaced with alternative reds, which suited us nicely. So at the end of a hard day's tasting, my inexpert palate concludes that Zinfandels and Cabernet Sauvignons came consistently top, with Syrah not doing too badly either. I think that's as sophisticated as I'll ever get.